Topic: FB Update: Boulware writes letter "Thank, you Clemson"
FB Update: Boulware writes letter "Thank, you Clemson"
Boulware writes letter "Thank, you Clemson"
Tribune. Ben did an excellent job! spirit and presence with the team forever? Wish at could but right now i think our best hope is my 5yr old son wearing a 10 jersey and helmet scaring every kid in the neighborhood. I'm so proud. letter's I have ever read from a player to future players and to his fan base!! That may actually be The Best one I've ever read! If you haven't read the full letter, you must click on the link and read it!! Ben, you will most definitely go down as one of The Great Ones, along with your entire team (whether starter or scrub team)! I share your fanatic passion and love for Clemson & Clemson football...I too grew up around it my entire life and have to say that our entire program & University exudes the most optimistic, loving family, hopeful & triumphant atmosphere in all of college football!! 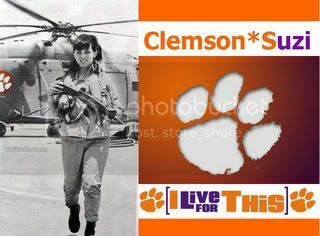 And at Clemson, we join as one, regardless of race, religion or ethnicity in our pursuit of greatness! That being said, I believe Ben Boulware is one of the best at conveying that message, especially after reading his letter! Deshaun & Ben have left a fantastic impression on Clemson football and for Clemson University that we should all give our absolute best in our pursuit of greatness! To Ben - I certainly look forward to your return to Clemson one day in some capacity as you are a wonderful help in adding layers to our foundation!! Re: FB Update: Boulware writes letter "Thank, you Clemson"
That frigging confetti, their should be a law in place that will stop it from being made. Anything that causes temporary blindness should be frigging outlawed!!! Yes, that darn confetti, gets stuck in your throat too! Nothing more can really be said to Thank You Big Ben. I just hope you can one day look back on all these wonderful comments and realize just how much you ARE loved by your Clemson family. I will add that your letter should hang in the new facility so every player, every recruit, past and present will read it. Your jersey number is certainly appropriate because you can't write 10 without writing the number 1 first, and you sir will always be numero uno !!! God Bless you and your entire family wherever the road may lead you. He can say ### and I can't. Actually, Ben can do a lot more chit than me. I said it before, and I'll say it again. All you munchkin heads out there who were making fun of Mr. Beefcake, all the wrasllin jokes, all the "he'll have trouble with the HR department", well, it's time for yall to grab a bowl of crow and start shoveling it in YOUR PIE HOLE. Mr. Boulware, I thought Tajh was the epitome of a Clemson Man. I think I just found him some competition. I have a feeling that you will go on to do some great things. And when the NFL is done with you, well, you know you will always have a home. Thank you Ben Boulware. You will certainly be missed.